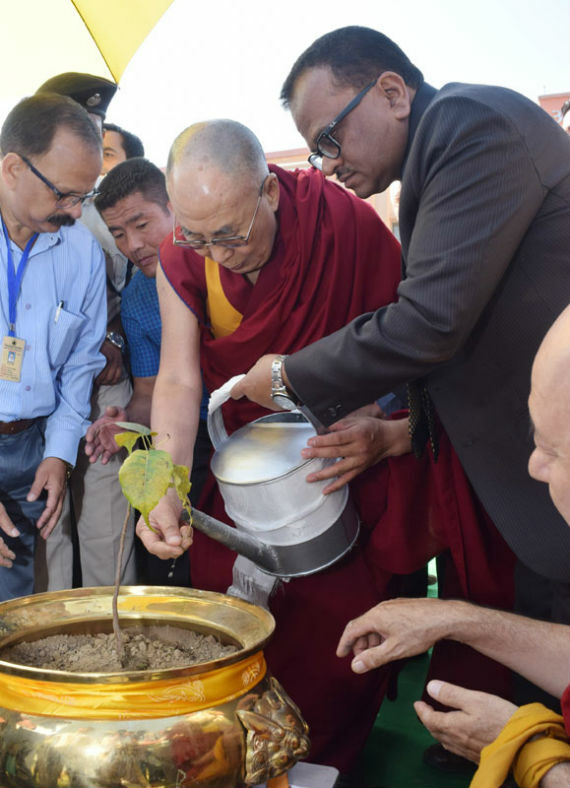 Nalanda: On the 2nd day of the ongoing International Buddhist Conference today, a new history was made when His Holiness The Dalai Lama visited the Nava Nalanda Mahavihara near Rajgir in Nalanda district of Bihar after a gap of 60 years and planted the sapling of the Bodhi Tree and inaugurated Nagajurna Faculty Building as well as Santarakshita Hostel. The Vice-Chancellor, Nava Nalanda Mahavihara, Shri M.L. Srivastava offered His Holiness a plaque of Nava Nalanda bearing its seal, originally found in the Ancient Nalanda Mahavihara. Registrar Dr. S.P. Sinha was among the dignitaries present on the occasion. His Holiness remembering His past visit to Nava Nalanda Mahavihara said that sixty years ago, it was the Chinese Prime Minister who was supposed to come. But for some unavailable reason, he sent His Holiness The Dalai Lama on his behalf to offer the body Relics of Master XuanZang to the then Indian Prime Minister Jawaharlal Nehru. The Dalai Lama thanked India for being a wonderful host which has offered him guest status for such a long time. Mentioning the tradition of Nalanda He said that Dignaga and Dharmakriti’s contribution is unforgettable for the world. He also mentioned about the contribution of Chandrakirti, Nagarjunand Buddhapalit. He said that Buddhism is science and it has compatibility with quantum physics. The Dalai Lama praised the rich spiritual tradition of India. He said Nava Nalanda Mahavihara should design its curriculum based on Nalanda tradition and focus on Ancient India. He praised India’s rich tradition of inner wisdom and secular tradition. The Dalai Lama said He Himself respects all the religious of the world, for all of them preach truth. On the occasion The Dalai Lama offered the Vice-Chancellor Shri M.L. Srivastava Thangka Painting with His message and a Buddha statue. The conference’s key objective is to deliberate on Buddhist perspective towards addressing or approaching issues such as ecological sustainability, social and economic justice, ethics and values, a holistic approach to education, inter-religious harmony and cooperation, gender equality etc. Discussions about fundamental human values and modes of disseminating and internalizing these ideals in contemporary settings are being organised. Reflecting on these questions in light of the teachings of the Buddha and of the great Buddhist masters, the Conference will recommend ways of addressing our most pressing problems and provide us with solutions to the challenges faced by humanity. Renowned Kathak dancer Manisha Guliyani and sarod players brother duo Amaan Ali Bangash and Ayaan Ali Bangash gave performances today. The International Conference is graced by more than 600 delegates from 32 countries. The President Shri Pranab Mukherjee will grace the valedictory function of the Conference tomorrow as the Chief Guest. Governor of Bihar, Shri Ram Nath Kovind and Chief Minister Shri Nitish Kumar will also attend the function tomorrow.